Blackadder signed a contract extension at The Rec until the end of next season in September, but the 47-year-old has been granted an early release. Former captain Stuart Hooper is expected to take on Blackadder's role. Bath, who are seventh in the table, said they would confirm their new coaching structure in the coming weeks. New Zealander Blackadder will depart after Bath's last game of the season with the Somerset side still in contention to reach the play-offs. They are due to face fellow top-four contenders Sale and Wasps and then strugglers Leicester in their last three regular season Premiership matches. 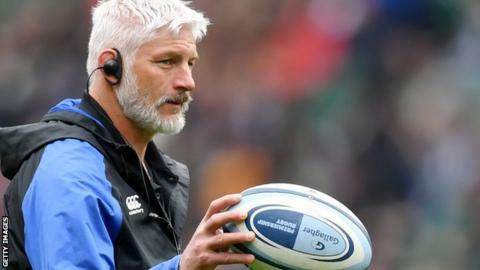 Blackadder joined Bath in 2016 after seven years as head coach of Canterbury Crusaders. He led the club to consecutive top six finishes in the Premiership and qualification for the European Champions Cup. "It's been an honour and a privilege to lead the Blue, Black and White for the past three years," he said. "I'm incredibly proud of what we have achieved. It might not be silverware, but together we have built strong foundations and I leave knowing that the best is absolutely yet to come." Hooper, 37, spent eight years as a Bath player before retiring in 2016 and is now their general manager.